Are you jumping with excitement for all the fairs, festivals, and petting zoos this summer?? I know I can’t contain myself!! At Rutgers, we even had some visitors stop by for our annual Summer Showcase and I was the star of the show. (Not to toot my own horn or anything…) Check me out on the right. Even though visiting other farms can be full of fun, it can also be full of cooties (if you’re not careful)! Protect your horses as well as the visiting farm’s horses by following good BIOSECURITY practices. Biosecurity?? Sounds dangerous or a government agency, doesn’t it? However, establishing good biosecurity practices helps reduce the spread of highly contagious diseases within your farm and to other farms via horses, people, trailers, equipment, and insects. In a few steps, you’ll be on your way to good biosecurity practices! Most diseases like influenza and strangles can be minimized through vaccinations. Consult with your veterinarian about your horses risk levels and then design an appropriate vaccination schedule. Assess: assess your farms risk level with help from your veterinarian. Produce: Come up with a biosecurity plan. Prepare: Prepare all equipment and facilities to meet the guidelines for your biosecurity plan. Educate: Discuss the protocols with everyone who has access to your farm and the importance of maintaining good biosecurity practices. Audit: Regularly check to see if the biosecurity protocols are being followed. Reassess: Reassess the plan if there was an outbreak to ensure it doesn’t happen again. Tack, grooming, feed/water buckets, pitchforks should only be used for your horses on your farm and not on your neighbor’s horses. In case of an outbreak, have a set of equipment to use in an isolation area and ONLY on the affected horse. Regularly disinfect equipment, tack, trailers, and YOURSELF. You can use a commercial brand of a spray disinfectant or a 1:10 dilution of bleach. It is important when visiting other farms, not to wear the same clothes and shoes you wear on our own farm and vice versa. Cooties (bacteria and viruses) can use you as their personal transportation system. 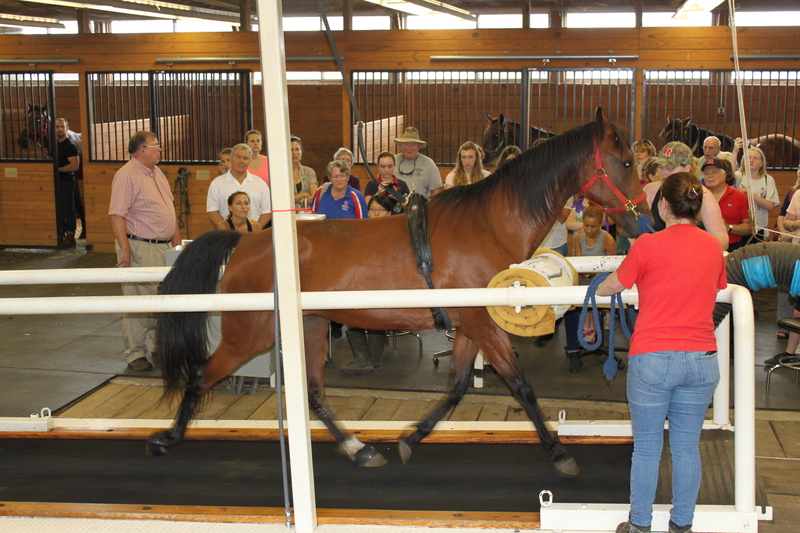 When you have visitors to your farm, make sure they park away from the horses and use a footbath or plastic shoe covers before they enter the barn. Put doormat in pan. Dilute disinfectant with water and add to pan so that the bottom of the mat is wet. 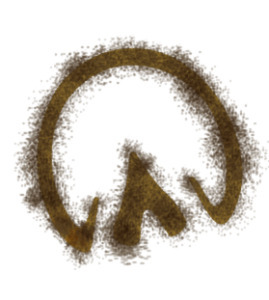 Visitors will scrub and disinfectant their boots before they enter the barn. Frequently change out the disinfectant water when dirty. Summer should be all about fun and county fairs and horsing around, but it is better for all horses involved to be safe. No one likes cooties. I know I don’t! Ewh! 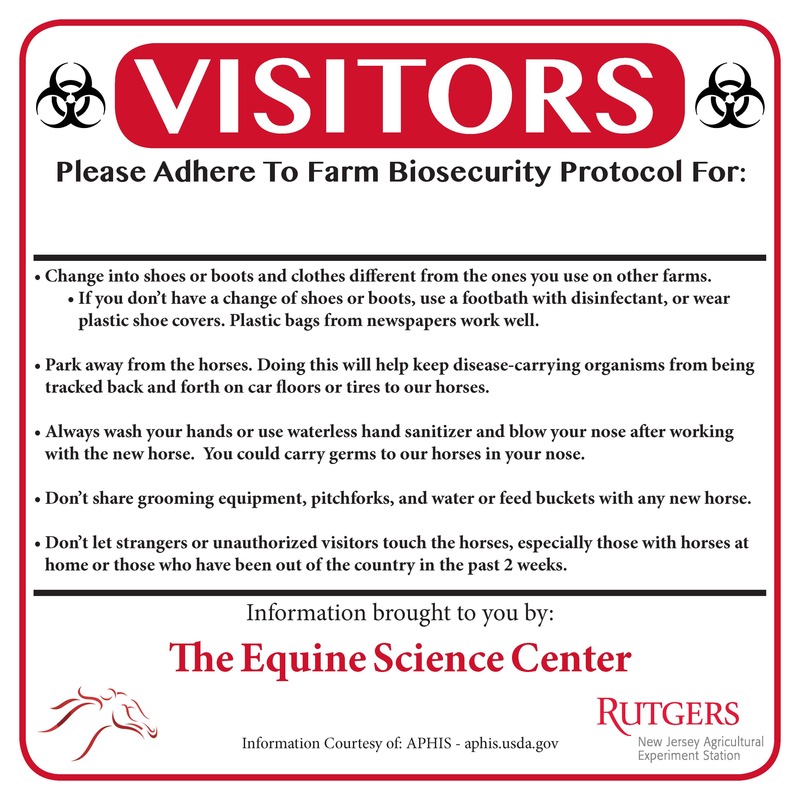 Also, remember to take a look at The Center’s Biosecurity signs for your farm! They’re free to download and can be hung up on your farm to remind people about proper biosecurity! For more biosecurity practices, check out the fact sheets from the USDA and the NJDA. August is Racing Month - Haskell and Hambletonian!